Ron Johnson recently came out banging the war drum and pushing for military action in Iran. Unfortunately, RoJo's need to overcompensate vicariously through the lives of our brave men and women in the military doesn't extend to caring for our veterans when the military actions are over. RoJo has a history of voting against any bill that might benefit veterans in any way, complaining that caring for our veterans costs too much money. Sadly, recent developments show just how deplorable RoJo really is. Doctors at the U.S. Department of Veterans Affairs medical center in Tomah hand out so many narcotic painkillers that some veterans have taken to calling the place "Candy Land." They call the hospital's chief of staff, psychiatrist David Houlihan, the "Candy Man." Current and former hospital staff members describe patients who show up to appointments stoned on painkillers and muscle relaxants, doze off and drool during therapy sessions, and burn themselves with cigarettes. They told The Center for Investigative Reporting that Houlihan himself "doped up" or "zombified" their patients and that workers who raised questions have been punished. Data obtained by CIR shows the number of opiate prescriptions at the Tomah VA more than quintupled from 2004, the year before Houlihan became chief of staff of the hospital, to 2012, even as the number of veterans seeking care at the hospital declined. In August, a 35-year-old Marine Corps veteran died of an overdose in the inpatient psychiatric ward. "It's a system that's gone completely haywire," said Ryan Honl, a Gulf War veteran and graduate of the U.S. Military Academy at West Point who in October resigned from his position as a secretary in the hospital's mental health clinic after two months, filing a federal whistle-blower complaint on his way out. Honl sent the information to both Senator Tammy Baldwin and to RoJo. And both of them sat on the information. Baldwin has already been rightfully criticized about the shoddy way she handled it. 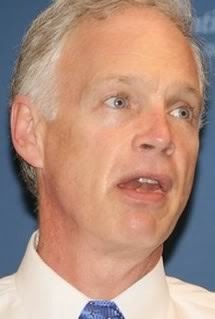 Aides to U.S. Sen. Ron Johnson have stated repeatedly that they referred a whistleblower's complaints about the troubled Tomah VA Medical Center to a U.S. Senate oversight committee last year. One Johnson staffer told the whistleblower that back in October, and the assertion has been repeated in media reports by another Johnson aide. But a spokesman for U.S. Sen. Claire McCaskill, a Missouri Democrat who ran the U.S. Senate Subcommittee on Federal Contracting Oversight, said Sunday that the whistleblower complaints never reached her or others in charge of the panel. The oversight subcommittee couldn't have taken formal action on the complaints last year without the involvement of the chairwoman or other Democratic members of the committee. "Neither Claire nor the majority staff received notification of these complaints," said John LaBombard, McCaskill's spokesman. A Johnson spokeswoman responded Monday that the complaints filed last fall by Ryan Honl, a former Tomah employee, did go from one Johnson aide on his Senate staff to Johnson aides assigned to the subcommittee. And there the complaints died. Johnson, a Wisconsin Republican, was the highest ranking minority member of the oversight panel last year. The Senate and subcommittee staffers both report to Johnson but have different command structures. "Our state staff referred the case to Senator Johnson's appointees to the subcommittee staff," said Melinda Schnell, the senator's communications director. "Because our subcommittee staff did not have the report, they did not, at the time, appreciate the severity of the problems at Tomah — nor did they bring the matter to the senator's attention." The report referred to by Schnell was a document prepared by the Veterans Affairs Office of Inspector General last year that found officials at the Tomah medical center were prescribing high amounts of opiate pain pills to patients. So not only did he have the information and do nothing with it, the matter is made worse by the fact that RoJo is on the very subcommittee that should have been investigating it if he had only opened his damn mouth for a constructive purpose for a change. Unusual that he let it go as he's always flapping his yap about something. Ron Johnson has no use for the 47% who are leeches of government like veterans on disability. Rojo looks like someone who doesn't want to be a U.S. Senator anymore, which is OK, cuz he has never acted like one and it will be our pleasure to help him find the door !